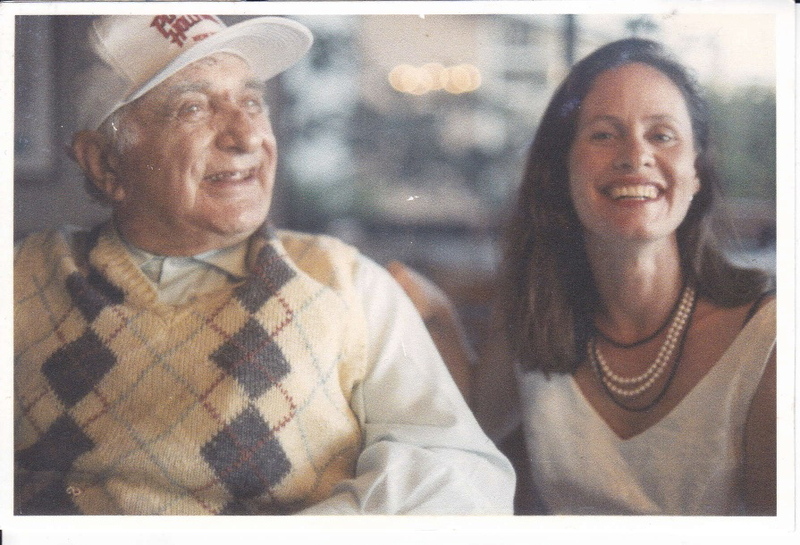 The beauty of my father was – well – so many things I’ll try and share with you. But one of them being that he would grade you. He’d give everyone an A or 100%. But, it was always a perfect score. So, first off, I’d like to give my dad 100 for being the best dad a little girl could ever have. Then, I’d like to apologize if I might get too emotional as I know the tone of Hollywood funeral’s is supposed to be sort of – lots of yoks. This is very hard for me because all of my life I would play this very masochistic game that I could just torture myself with envisioning this day and in a second I’d have this huge tear stained face which I should have used for crying on cue but I never did when I was an actress in my 20s. My mother used to describe a scene to me: That when I was about a year old (preverbal) I had my arms wrapped around my father’s neck in an embrace that created a competition from that day forward. I apparently looked back towards her, darting a look, clearly stating he was mine. And, he was. Later, after 35 years of divorce, he remarried my mother – but before doing so, said if he could marry me – he would. You see, he was marrying my mother so that when he died, she could get his social security. We thought my mother would live 20 years past him and would be getting $1200 a month. Money he wished could go to me. When I was nine years old, I worked for my father in a movie called Twist All Night with Louie Prima. I got paid $50 that I spent on piano lessons. I had around three lessons in a class and then there was a new Yamaha piano my dad had promoted as a gift for me. Later, when I took drums, he promoted a Ludwig drum set. It was a life of freebies. To this day, I’ve never paid for Disneyland tickets. 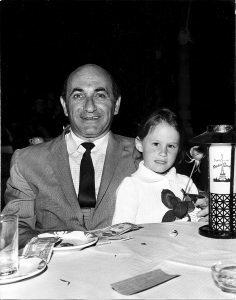 In one call, my dad would have tickets to shows, Disneyland, the circus – anywhere I wanted to go. He was so bold and taught us that rules were meant to be broken. We never stood in line for anything. He felt entitled and he’d just give a big geschrei and point that cane around. People might get annoyed but invariably we would be in a theater before anyone, or a plane or even the DMV. I was a very ugly little girl. Buck teeth, crossed eyes, scrawny, short. I came home from school on my 12th birthday. There were a dozen red roses and a note from my adoring father who clearly only saw me as his beautiful daughter. I’ll never forget how special those flowers made me feel. There wasn’t anything my father wouldn’t do for me. Every kid should be that well taken care of. He just poured his love into me. Every day of my life, for 43 years, I was told that I was pretty, smart and the greatest. When I saw him there on life support, it killed me – he, whose always been my life support. I was having such a hard time. He wasn’t breathing life into me. I’ve been so meshed with my father for so long, I couldn’t understand how the respirator worked for him and not for both of us. Every single person that I’ve spoken to in the past few days has said that my father was their most favorite person in the world and how much they’ll miss him. He had the most infectiously happy and great personality. People just got addicted to sitting in his presence. It was like a cult and he was our guru. Later I will be serving cyanide laced Koolaide for those of you that would like to join him. On behalf of all of my girlfriends, I’d like to thank my dad for being a surrogate father to them. Some had father’s that had died. Some had father’s that didn’t live here. He was always there for them. Five years ago, I went to a party at Johnny Carson’s house with Michael. The Les Brown band was performing. I was quite taken with Henry Butch Stone who was performing. I was like a groupie for him. He was around 80 years old. I decided I had to meet him. I knew my dad was an old friend of Les Brown. I walked up to Les and told him I was Maurice Duke’s daughter. I asked him if my dad knew Henry Butch Stone. He said, “Of course. Your father is such a hipster.” And, really, he’s right. You can’t get much hipper than a father that was friends with Lenny Bruce, Zero Mostel, Louis Prima and Bobby Darin. You know it was a little eerie watching him die at Cedars where Oliver was born 13 years ago. And, at that time, he said he just wanted to stay around long enough to see Oliver get Bar Mitvah’d. Oliver had a Bar Mitzvah in June. My dad got ill 6 weeks later. At Oliver’s Bar Mitzvah, Oliver and I both dedicated our speeches to my father – who heard nothing. He was like an ADD child fidgeting in his seat and playing and talking to people around him. So, he heard nothing of how I was passing the torch of my father’s adoration of me – to Oliver – who was now the apple of his eye. I also said that he needed to renegotiate the contract he made from 13 years ago about staying around long enough for the Bar Mitzvah. But, I guess he forgot to sign the contract. When my daughter, Augustine saw me so devastated about the imminent death of my father, she asked, “So, you actually love Grandpa more than us?” And I answered that most people love their children more than anything, but I have to answer honestly that I love my father as much as my children. When he was ready to die in the hospital, I became very ritualistic. I went to his house to retrieve his cane and I put it in his hand so when he died, I could take a piece of him with me. And, I hope I always have a piece of him with me. I was the luckiest little girl. I was treated like a princess by the Duke and I’m pretty convinced I’m royalty. Food: You know what to do with food after a funeral. Invite people to a home, preferably a nice one that will hold a lot of people and then order platters and platters of deli. No. Not just any deli. You can’t go to Costco for this. If your dad just died, do the right thing. Pick up Nate n’ Al’s. In our case the waitresses Kaye and Gloria were waiting at my dad’s place to serve his friends — that they thought were sort of hanger on-er’s taking advantage of some freebie meals. Oh, also, Nates gave us all the food — as a parting gift. Read The Duke’s obit in the L.A. Times HERE. This entry was posted on Monday, April 8th, 2019 at 6:20 pm	and is filed under Uncategorized. You can follow any responses to this entry through the RSS 2.0 feed. You can leave a response, or trackback from your own site.